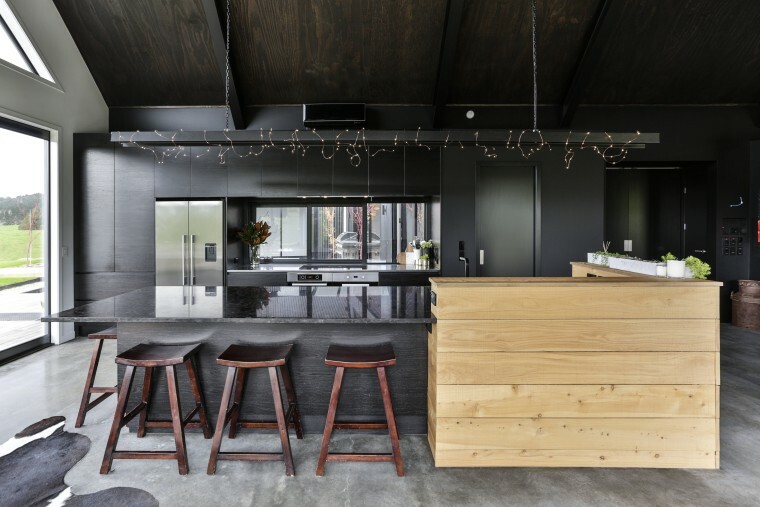 An untreated macrocarpa upstand is a feature of this kitchen by designer Kyla Hunt. Industrial surfaces and a raw, honest feel might call to mind a trendy New York-loft style kitchen. However, the same rugged materials and simple approach can be equally well suited to, say, a rural kitchen. This black kitchen by designer Kyla Hunt of Carlielle Kitchens shows how. 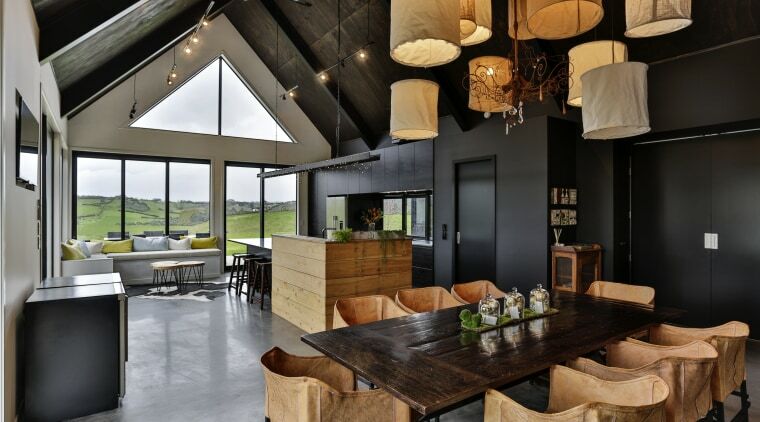 The kitchen forms part of an architecturally designed home with expansive rural views, the black, pavilion-style home sitting in contrast with the green, rolling landscape. "In keeping with this, the owners wanted the open-plan living space kitchen included to have a bold look, which would complement the exterior of the home and create a moody, dramatic interior," says Hunt. "This translated into an industrial loft-style, with a focus on raw, natural materials." And raw materials there are in abundance. Taking a tonal cue from the owners' caramel-coloured leather chairs, the designer introduced a rough-sawn macrocarpa wall to wrap around one end of the long kitchen island. This creates a striking contrast to the black cabinetry in a dark-stained Black Onyx veneer. This upstand also adds warmth and texture, and provides screening eliminating the view of clutter around the sink area from the living spaces. The list of industrial materials continues with stainless steel used on the rear benchtop for a hard-wearing surface that flows onto the window sill for a seamless look. 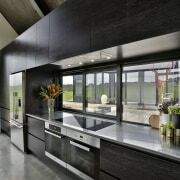 The window glass forms the splashback. In the scullery, the benchtop is finished in stainless steel-look Formica. This was a more affordable option here than actual stainless steel, plus the scullery benchtop is not subject to such heavy use. 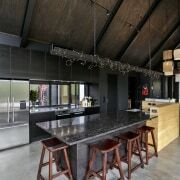 A black understated island benchtop, black-stained veneer cabinetry and a stainless steel perimeter bench are just some semi-industrial finishes in this kitchen by Carlielle Kitchens that connect with the wider interior. With a large family to cater to, including four adult children, the kitchen also needed room for several people to work in the space at once. "To this end, the sink is towards one end of the 4m island, maximising the remaining bench space and providing for breakfast seating," says Hunt. "And the modest, understated scullery creates a space to hide away small appliances and maximise kitchen storage." 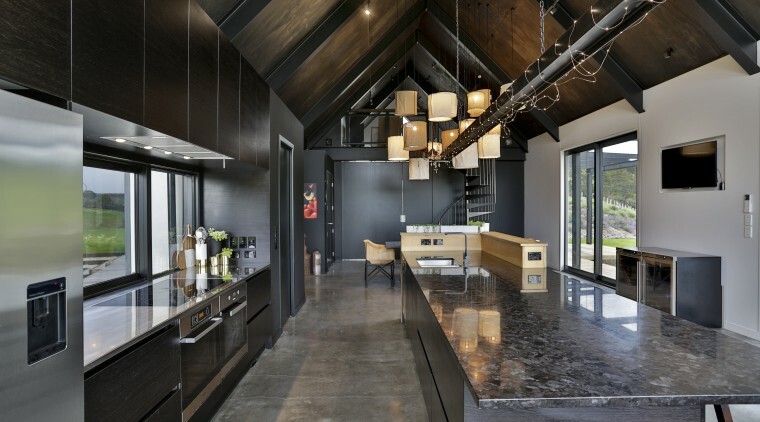 Having the galley-style kitchen blend with the wider interior's black-painted walls, timber ceiling and character concrete floors accentuates the contrast and texture of the material palette.